A comprehensive encyclopedia of literary and cultural theory. 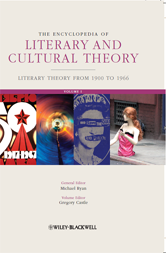 Covers Literary Theory from 1900 to 1966, Literary Theory from 1966 to the present, and Cultural Theory. This encyclopedia provides accessible entries on the important concepts, theorists and trends in post-1900 literary and cultural theory. With explanations of complex terms and important theoretical concepts, and summaries of the work and ideas of key figures, it is a highly informative reference work for a multi-disciplinary readership.